The daylily is not only a versatile wild edible but a beautiful and easy-to-grow perennial garden flower. It is native to Asia and has escaped cultivation over most of eastern North America. Daylily is a familiar sight alongside streams, roadsides, and fences. Chances are you are already living close to a patch of this showy member of the Xanthorrhoeaceae family. Hemerocallis fulva, the scientific name of the daylily, translates from Greek to Kallos – beautiful and Hemera – Day. The common name is derived from the fact that daylily flowers only open for one day. During its flowering season, one can observe the plump buds of tomorrow’s flowers, the yellow-orange open flowers of the day, and the wilted flowers from yesterday. Cultivated in Asia for millennia, the dried flower buds are sold as “golden needles” and are an important ingredient in many traditional kinds of soup. 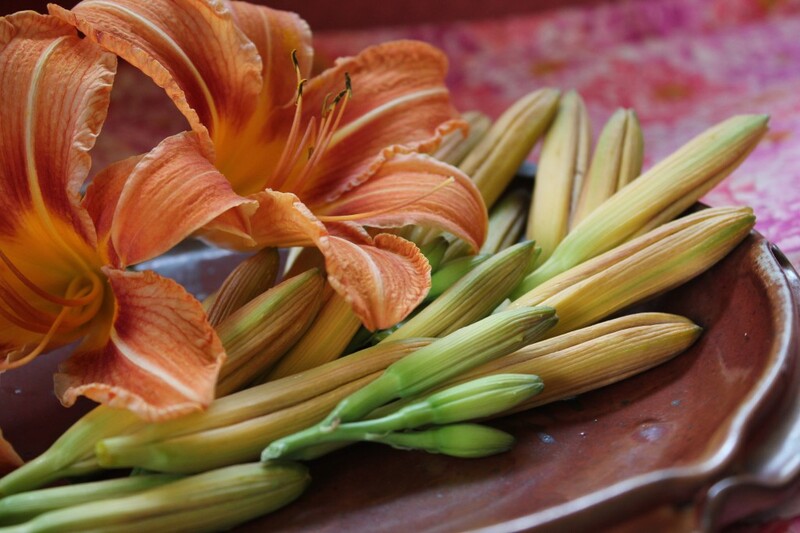 Having grown up in the suburbs where daylily is a common garden perennial, I was naturally drawn to yummy flowers when I first began experimenting with wild foods.The flowers petals may be pulled apart and added to salads or as a gorgeous garnish to any dish. They can also be added to a stir –fry prior to serving, which will help to retain their color and soften their texture. The plump, almost-open, flower buds may be dried thoroughly and sealed in an airtight container for re-hydrating in soups or casseroles during the winter months. The dried flowers add a sunny dash of beta-carotene and Vitamin C to any dish. My favorite way of serving the fresh flowers is to stuff them – in the mouth. Please see the photo below of stuffed daylily flowers and the accompanying recipe below. In extolling their virtues, I feel I should offer this caution. Some people are allergic to daylily and react to them with vomiting and diarrhea, especially when eaten raw. It is a small percentage of people who experience these unpleasant reactions – perhaps one out of fifty. It is prudent to start with a few cooked flowers or shoots and slowly eat larger portions if no gastric upset is observed. Following this protocol, any serious allergic reactions should be avoided. The yummy shoots are sprouting up in southeastern Utah in early March. (See the above picture) They are edible raw or sautéed, steamed etc. I prefer them mixed with other greens if eaten raw, as the other greens can mask their funny after-taste. They are excellent sautéed in a little olive oil, tamari, and garlic. Daylily greens may be picked until they start to become tough or fibrous, which often happens when they are about eight inches or so. I clip them with scissors at ground level and then cut off the tougher outer portion of the leaves and eat the tender inner growth. Cutting back the plants three or so times during the spring hasn’t slowed down my patches. The roots keep on sending up new shoots. It is important to correctly identify daylily shoots as they resemble some very poisonous plants which grow in similar habitats. Until you know the plant well, familiarize yourself with some patches in summer when the plant is easily recognizable by its 6 yellow-orange “petals” (botanically these are actually tepals). Revisit these patches in the spring and you will begin to be able to identify the shoots. Make sure you are not confusing the shoots with Iris (much flatter leaves and rhizomes which grow laterally just under the soil surface). Please see the picture below of daylily’s root system, and note it does not have a bulb as found in daffodils and tulips, nor does it have the lateral rhizome of an Iris. I have also seen daylily shoots interspersed with the new growth of daffodils and other bulbs. It goes without saying that you should know what it is you are eating. Consult an experienced forager or wild foods book if you are in doubt. Sauteed two cloves of garlic and one-half of an onion in olive oil and add wild greens in season. Lamb’s quarters (Chenopodium album), Nettles (Urtica dioica) and Lady’s Thumb (Polygonum persicaria orPersicaria spp.) are all yummy choices. Crumble in one block of tofu or goat cheese and take off heat when greens are tender and still green. Make sure to cook the greens thoroughly if you have added nettles to remove the potential of their sting.